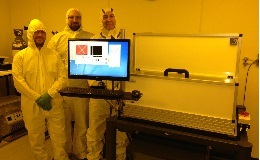 A MicroWriter ML2 direct-write optical lithography machine has been successfully installed in the Centre for Graphene Science at the University of Exeter. The Centre is the hub of an international network of leading institutions researching graphene and is rapidly building connections with industry. MicroWriter ML2 is our new 2013 release of the MicroWriter ML and adds greyscale lithography and better microscopy and alignment features to the original machine. Of particular importance to graphene research is the MicroWriter’s ability to align exposed structures to individual flakes of randomly oriented flakes of material.